This recipe and I have a love hate relationship. There was a lot that went into this recipe for the picture looking so simple. First I could not find creme fraiche at the grocery store so I attempted to make my own. Needless to say, it didn't turn out that great. 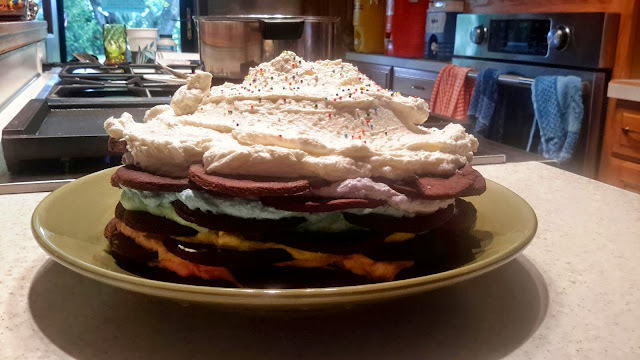 Secondly, I did not understand how the rainbow whipped cream could be so complicated. Why does it have to sit in a colander with cheese cloth for 3 hours? After the creme fraiche episode I decided to just go with adding all the ingredients and whipping until some stiff peaks formed, and then split them up in the containers and add the colors. When I assembled the cake it all went together just fine so I don't see why it can't be done in this manner. I decided not to make the final heavy whipping cream for on top as the whipping cream that I had made for the layers was enough to have left over for a big pile of whipped cream on top. Now, let's get to the cookies. These things came together okay but then when I tried to roll them up they just were a crumbly mess and I had to add water to them in order to get the dough to the consistency to be able to roll out. They turned out fine in the end but they were very annoying trying to roll out and cut out. So here is where the love hate relationship comes into play. As much as I hated trying to figure out how I was going to make this recipe with all the stuff that I did not feel I needed to do, I ended up really liking the final results. I would have used more food coloring in the layers but other than that the results are fabulous and the cake tasted amazing!